This book gives a consolidated overview of the research results achieved in the theory of automata, logics, and infinite games during the past 10 years. Special emphasis is placed on coherent style, complete coverage of all relevant topics, motivation, examples, justification of constructions, and exercises. Mathematical logic and automata theory are two scientific disciplines with a fundamentally close relationship. The authors of Logic and Automata take the occasion of the sixtieth birthday of Wolfgang Thomas to present a tour d’horizon of automata theory and logic. 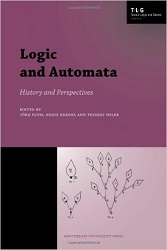 The twenty papers in this volume cover many different facets of logic and automata theory, emphasizing the connections to other disciplines such as games, algorithms, and semigroup theory, as well as discussing current challenges in the field.